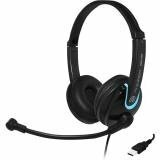 EDU-255 USB On-Ear Stereo Computer Headset features noise-canceling microphone with internal windscreens, plush easy-to-clean leatherette ear cushions, heavy-duty rigid wire boom and swivel, and extra long 8-foot shielded cable with built-in external sound card and USB plug. Recommended for the education market. If you have any questions about this product by Andrea Communications, contact us by completing and submitting the form below. If you are looking for a specif part number, please include it with your message.